is a video capture and encoding software for streaming live video and audio to internet based media servers and other network clients. nanoStream is compatible to latest generation internet video encoding standards and supports Flash and iPod compatible H.264 encoding modes, from low resolution mobile video up to Full HD highest quality video streaming. Several Extensions are available, for 3d stereoscopic video encoding and streaming from multiple camera views, and additional coding formats; MPEG-2, WindowsMedia and VP8. 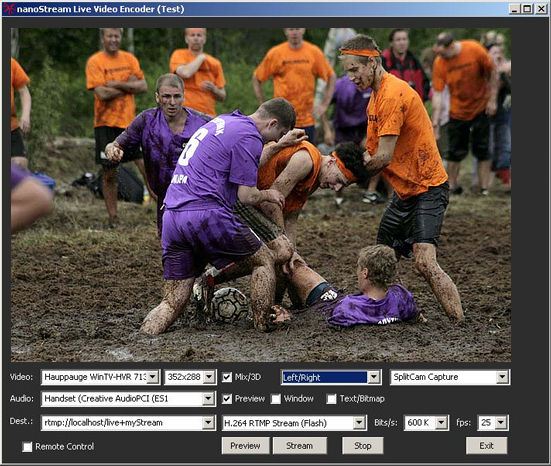 nanoStream Live Video Encoder supports internet broadcast scenarios such as live entertainment, sports, concerts, news, educational content. nanoStream is your best choice to supply plugins if you are planning to create internet streaming solutions for WebTV, IPTV, video conferencing, VOD. Working perfectly together with internet streaming servers like Wowza Media Server and Flash Media Server, streaming to Mobile devices like iPhone, Silverlight and other playback clients is possible. If you want the best quality internet streaming solution, nanocosmos is your partner. The Encoder is based on applications and plugins and is also available as a ready-to-use installation kit. The modular architecture based on DirectShow is available as a Software Developer Kit (SDK) for integrating live video encoding and streaming functionality into custom applications. The Plugins are compatible to most browser architectures, including Internet Explorer, Firefox, Safari and Chrome (currently Windows only). All components are optimized for high performance and are available for Windows. Available as SDK, Plugins and Application for Professional Video Users and Developers. With our long-term expertise in video format conversion and custom development for professional video customers, we are able to provide high quality, high performance custom applications, consulting and support services. Our professional integration and customization services help you getting your video applications to market quickly.